Notes: Butler Trowlesworthy 2. 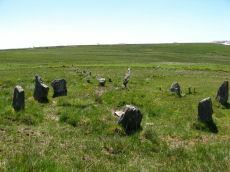 "A single stone row consisting of 35 upright and 13 recumbent stones running in an E to W line from the site of a possible ring cairn at the foot of the SW flank of Little Trowlesworthy Tor. The cairn at the head of the row is marked by a circle containing one upright and eight fallen small slabs and boulders. Within these is a slightly raised area, perhaps the remains of a cairn." Lethbridge p.57-8, diagram p.58. Notes: Turner Stone Circle G25. 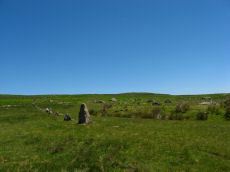 Cairn circle at head of stone row. "The circle 6.5m. in diameter comprises eight orthostats from 0.7m. to 1.5m. high. In some cases the 'trig' stones are visible." "The alleged cairn at the head of the row comprises a ring of eight stones a maximum of 1.2m high with no evidence of a cist and very little to suggest the former presence of a cairn. It would seem more likely to represent the remains of a small stone circle albeit only 6.0 to 6.5m in diameter." See also, Legendary Dartmoor: The Pulpit. Lethbridge p.57-8, diagram p.58. Notes: Turner Stone Circle G26. This is a cairn circle at the east end of the Trowlesworthy Warren (W) stone row. "At the east is a 4.5m. diameter circle of 10 stones; average height 0.4m. There is no visible cairn or cist in the centre. Two upright stones immediately to the north west of the circle are probably associated. "